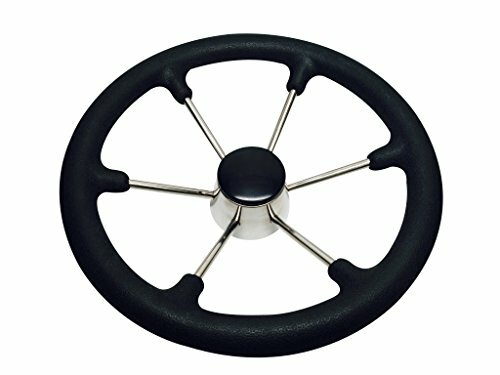 Pactrade Marine Boat SS304 Steering Wheel with Sleeve 6 Spoke, Black by Pactrade Marine at Lake Como Italy. MPN: P73064-01B. Hurry! Limited time offer. Offer valid only while supplies last. This high quality steering wheel is made of SS 304 with black sleeve. Finger grips and a handy control knob make this wheel a pleasure to steer with. This high quality steering wheel is made of SS 304 with black sleeve. Finger grips and a handy control knob make this wheel a pleasure to steer with. 13 1/2" diameter black sleeve black cap 25° dish angle fits 3/4" tapered shafts product number: P73064-01B.